The reading material is up-to-date as of February 2018 on the California laws addressed in this course. 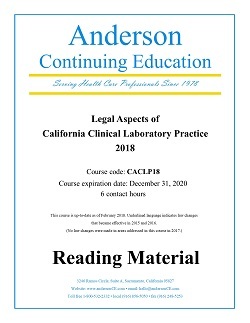 Legal Aspects of California Clinical Laboratory Practice is a guide to the California laws governing your clinical laboratory practice. It gathers these laws from their various sources—the Business and Professions Code, Health and Safety Code, and Titles 17 and 22 of the Code of California Regulations—and then explains them in English. This course is updated as laws and regulations are changed. You’ll read about the laws that govern: Scope of practice of clinical laboratory personnel, including phlebotomist certification requirements and medical technician licensing • How certain tests must be performed and under what conditions • Reporting test results • Regulation of clinical laboratories • Removal of licenses • Consents • Medical records • Malpractice.